One of the great songs by Harold Arlen and Johnny Mercer, “That Old Black Magic” was written in 1942 and first recorded by Glenn Miller. 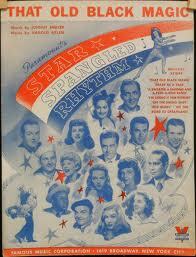 It was also used in the 1942 movie Star Spangled Rhythm. It’s been recorded many times and used in several films, including the 1956 film Bus Stop, where it was sung by Marilyn Monroe. “That Old Black Magic” was recorded on March 13, 1962 for On The Glory Road, which was to be released in 1962, but was canceled. The song was arranged by Ralph Sharon. “That Old Black Magic” was recorded live at Tony Bennett’s concert at Carnegie Hall on June 9, 1962, but was not released until 1997 on the album Tony Bennett at Carnegie Hall: Complete Concert. Ralph Sharon arranged the song. “That Old Black Magic” was recorded on August 28, 1962 and released in 2013 on the album Bennett/Brubeck: The White House Sessions Live 1962. This number was from an unrehearsed improv set with the Dave Brubeck Trio.